Eggs complement asparagus so well—think of asparagi alla milanese, topped with a fried egg— and they complement cured pork too—bacon and eggs, anyone? And then again, asparagus and pork get on very nicely, too, as in the classic Asparagus Wrapped in Pancetta. So what could be more natural than getting all three ingredients together? That’s what this Asparagus and Pancetta Frittata does beautifully. Like any frittata, Asparagus and Italian Bacon Frittata is a great choice for a spur of the moment meal, served in big wedges. It can also be left to cool and cut into smaller pieces as a part of a buffet or as ‘finger food’ to enjoy with an aperitif. Cut off the bottom quarter of the asparagus stalks. (You can use the bottoms if you like for another purpose—see Notes.) If you’re working with rather thick asparagus, you’ll want to peel the stalks as well. Cut the asparagus into short lengths, setting the tips apart. In a medium-sized non-stick or seasoned carbon steel skillet, sauté the pancetta very gently in a bit of olive oil until the fat has almost completely rendered and the pancetta has (very slightly) browned. Add the spring onion and let it soften a bit. While the asparagus is simmering, beat the eggs in a mixing bowl with salt and pepper to taste and, if using, the grated Parmesan. When the asparagus is done, add the beaten eggs to the skillet, folding them together with the asparagus with a spatula. Now proceed to gently fry your frittata following the master recipe, cooking the eggs on one side and then on the other until nice and golden brown. There are three ways of making a frittata. The two traditional methods which involved frying the eggs in a skillet (the very word frittata means ‘fried’) but there is a more modern oven-based method, which you can check on in our post on Baked Zucchini Frittata. If you want to bake your Asparagus and Pancetta Frittata instead of frying it, let the asparagus and pancetta ‘filling’ cool off (so it doesn’t prematurely scramble the eggs) and add it to the bowl in which you’ve beaten your eggs. Mix everything together and pour the mixture into a well-greased baking dish. Bake at 200C/400F for a good 15-20 minutes, until the eggs are set and the top is nicely browned. For a slightly fancier version of Asparagus and Pancetta Frittata, you can add the cooked asparagus and pancetta filling into the bowl and fold it into the raw eggs. The contents of the bowl are then added to the skillet, in which you will have melted some butter, perhaps with some olive oil. The butter gives the dish a slightly sweeter flavor. Like many Italian recipes, measurements here are only guidelines. For me, the balance here is perfect, but some people like more or less filling vs. eggs in their frittata. Meat lovers might want more pancetta. And if you want, you can add more Parmesan cheese, or none at all. The dish is at its best when made with pencil-thin, strongly flavored wild asparagus. You won’t find them in stores, that I’m aware of, or even in farmer’s markets. In Italy they grow wild and people like to forage for them, just as many people forage for wild mushrooms or wild chicory and such. There is a strong tradition of foraging in Italy, a legacy, I suppose, of leaner times. And if you have some patience and a mind to do it you can forage for wild asparagus here in the US; this USDA map shows all the counties where asparagus grows wild—and I was really surprised at how widespread it is. The dish is at its best when made with pencil-thin, strongly flavored wild asparagus. This recipe uses only the the tenderest top part of the asparagus, but the bottoms need not go to waste. You can put them to good use to make Cream of Asparagus Soup or an Asparagus Risotto, or to dress tagliatelle, or in my favorite kind of ‘white’ lasagne. Cut off the bottom quarter of the asparagus stalks. (You can use the bottoms if you like for another purpose—see Notes.) If you're working with rather thick asparagus, you'll want to peel the stalks as well. Cut the asparagus into short lengths, setting the tips apart. Now proceed to gently fry your frittata following the master recipe, on one side and then on the other. Delicious recipe Frank! 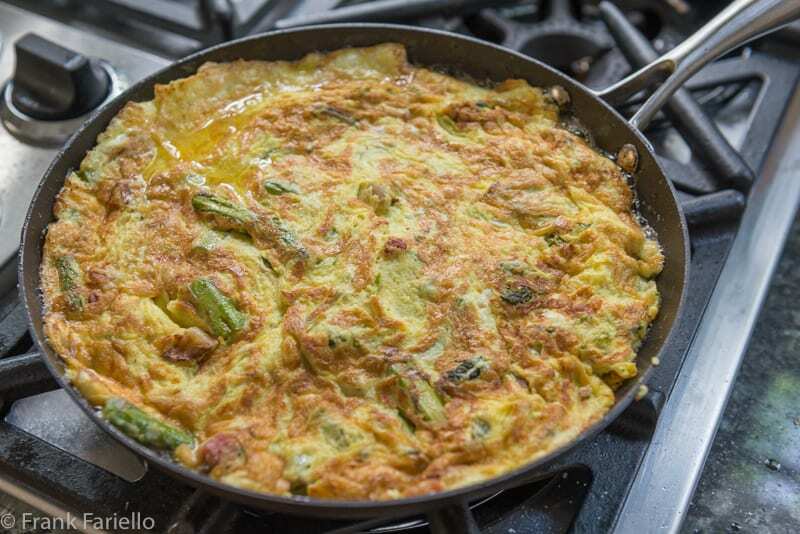 We love frittata, but haven’t tried it with asparagus in the past;sounds really good! We’re thinking of adding a handful of finely chopped dill as well, have you tried any herbs with this recipe before? Thanx for another yummy idea! This is the same we we make our frittatas and my mother LOVES asparagus, but me, not so much (although I discovered in France or Germany, that I really like the big white kind!) My favorite frittata is potato and bacon/pancetta! I could happily eat this for breakfast, lunch or dinner! I don’t think I’ve ever eaten eggs and asparagus together — it sounds amazing! I’m always afraid that I’ll burn the frittata if I leave it on the stovetop, so I switch it to the oven sometimes. Thanks for the tip about that! I am making this tonight. Thank you in advance. Perfect late spring fare. Frank – I think once I discovered pancetta, I have never gone back to American bacon. I know that is criminal to many people, but I just love pancetta. The combination of asparagus and pancetta is, indeed, a perfect match. I’m not surprised, David, although I have to say, I do like my bacon once in a while, too. When I’m in the mood for that smokey flavor. My parents made frittata all the time when I was growing up (I’m 67). On Saturday mornings, my dad would gather the leftover vegetables and sometimes meat from the week’s meals. He would add tomato and Locatelli cheese. It always tasted great. Thanks for this recipe. I like having a procedure to follow rather than winging it. Sounds wonderful, Art. My grandmother was a master frittata maker—her was usually potatoes, peppers, onions and maybe some sliced sausage. It was fabulous! Frittata has always been my go to dinner with a salad, especially with the current heat wave we have been experiencing. Asparagus & pancetta, a classic combination with eggs make this frittata wonderful at any time of day. That is a gorgeous frittata, Frank! Eggs, asparagus, and pork are perfect together! This brings such warm loving memories of mamma making this for the family. Every time I think of her making asparagus it was always with eggs. They just seem like they belong together. Love the photos! Have a wonderful weekend. Enjoy your weekend, Marisa Franca! Hello, I just wanted to let you know that I really love your website. un piatto unico che risolve la cena in modo semplice e nutriente, buon fine settimana Frank !